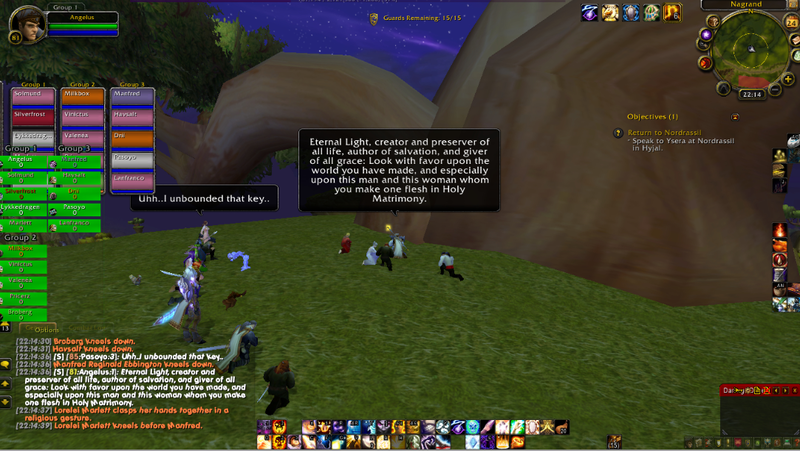 A very special event took place on the realm of Moonglade. Solmund and Lykkedragen got married, and were wed in Nagrand. 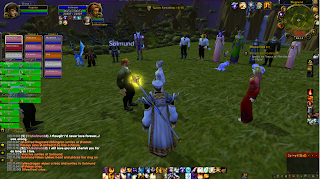 My priest had the honour to perform the ceremony, and the guests, who consisted of friends and guildies, were a rather mottled bunch. Of course the event would have been nothing without all the guests, so big thanks to all of them on my behalf as well. 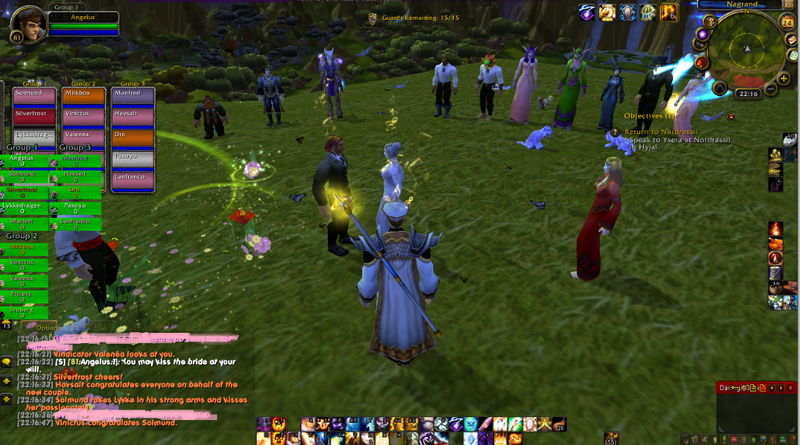 Below is the ceremony with some screenshots included. There were plenty of other emotes in it, too, but I couldn't catch all of them. Something borrowed was from them christian fellers, as the ceremony itself was very christian-inspired, as it seemed to fit the wedded couple. No blasphemy was intended and no blasphemy took place, and it shouldn't be considered such - I personally don't even see why it would be. Angelus: Dearly beloved family, friends and fellow Azerothians. We have come together in the presence of the Light to witness and bless the joining together of this man and this woman in Holy Matrimony. The union of husband and wife in heart, body, and mind is intended for their mutual joy; for the help and comfort given one another in prosperity and adversity. Marriage is not to be entered into unadvisedly or lightly, but reverently, deliberately, and in accordance with the purposes for which it was instituted in the name of the Light. Into this holy union Solmund and Lykkedragen now come to be joined. If any of you can show just cause why they may not lawfully be married, speak now; or else for ever hold your peace. I require and charge you both, here in the presence of the Light, that if either of you know any reason why you may not be united in marriage lawfully, you do now confess it. Lady Lykkedragen of Silverbeam, will you have this man to be your husband; to live together in the covenant of marriage? Will you love him, comfort him, honor and keep him, in sickness and in health; and, forsaking all others, be faithful to him as long as you both shall live? Angelus: Solmund Strongheart, will you have this woman to be your wife; to live together in the covenant of marriage? Will you love her, comfort her, honor and keep her, in sickness and in health; and, forsaking all others, be faithful to her as long as you both shall live? Angelus turns towards the bestman. Vows... With UI. I don't really keep the healing addon there. Angelus: May I have the rings, please? Angelus holds the rings on the palm of his left hand, placing the other one on top of it. As the rings are sealed between his hands, a warm, golden glow escapes from between his fingers. May your love remain like these rings – forever pure, forever untarnished. Angelus hands the rings over to Solmund and Lykkedragen. You may say your vows. Solmund: Lykke, you are my north, my south, my east and west. My working week, my Sunday rest. My noon, my midnight, my talk, my song. I thought I'd never love forever... I was wrong. I will love you and cherish you for as long as I live. Lykkedragen: I will always stand by your side, because you make me smile when I feel like the world is ending. You give me strength to keep on fighting, because you are my reason to keep standing. You make my heart and soul sing, and every minute I'm away from you feels like an eternity of pain. I will always stand by your side, protecting you with my last breath. I will be your light when the world gets dark. I will always stand by your side, because you are my music, my strength, my light, my faith. You are my everything. I love you. Angelus: By the right and honour I have been granted, I now declare you husband and wife. Eternal Light, creator and preserver of all life, author of salvation, and giver of all grace: Look with favor upon the world you have made, and especially upon this man and this woman whom you make one flesh in Holy Matrimony. Light be with you, Solmund and Lykkedragen. You may kiss the bride at will. 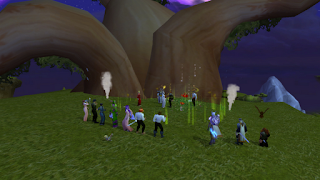 I wish to thank the wedded couple for their permission to make a blog post out of the lovely event, and each person for making it as it was! Once again congratulations to Sol and Lykke! And as of today, I felt happy on the game after a while now. 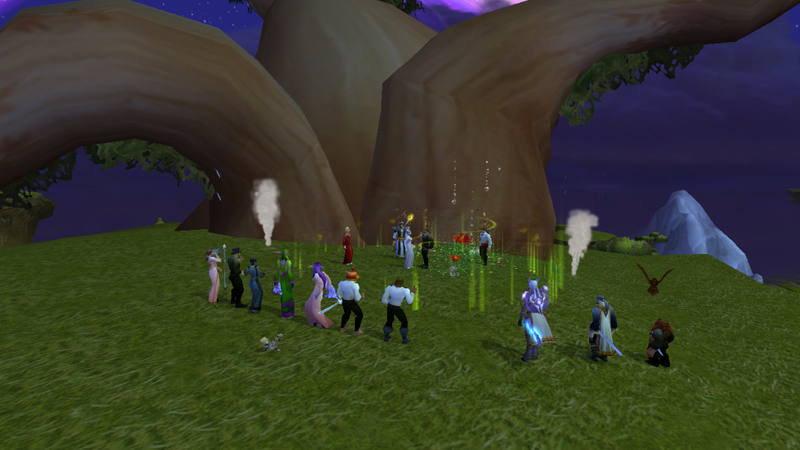 I love RP weddings. <3 Naturally, I screencap everyone's weddings to a point where I have a gigabyte of screenies of each BUT I didn't get one single screencap of my own character's wedding... nor did my boyfriend, who RPs the husband. ;_; And it was a pretty wedding too, I spent close to 6000 gold on the outfit alone because I just HAD to have that white dress usually worn by nelven slappers, the white clingy booby moonglow-thingy one that sells for a ridiculous price on RP servers, combined with a white pirate shirt. That sounds like a lovely outfit for a wedding! :D Pity about the lack of screenshots. 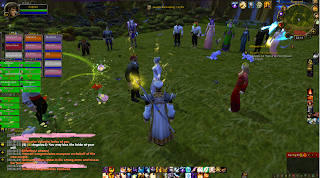 :( I think I should begin to RP a journalist, who can be hired to screenshot weddings... Sol & Lykke's wedding was actually the first one I have ever attended, and none of my characters have got married in-game. One has in his lore.